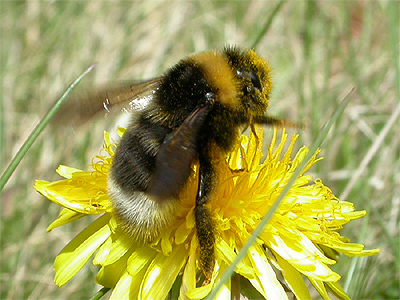 Bumblebees are known to everyone and the various species' make up one of the most familiar group of insects. 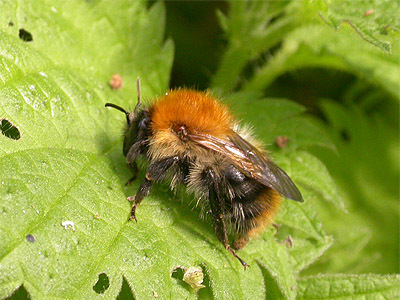 Whilst some bees are solitary, Bumblebees are social insects, forming small colonies during the Spring and Summer months. 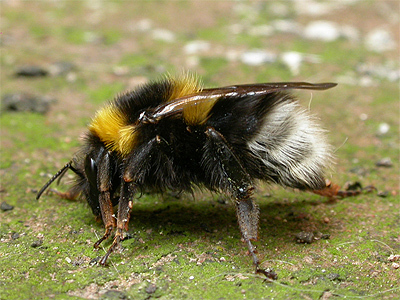 Unlike some other bees which nest above ground, most Bumblebees formed their nests at (or below) ground level. That was until the arrival of the now extremely familiar Bombus hypnorum, often regularly referred to as the Tree-nesting Bumblebee, yet more likely to utilise a nest box or roof space. Also featured are three Cuckoo Bees (formerly Psithyrus sp), which are cleptoparasites of two of our most familiar Bumblebee species. 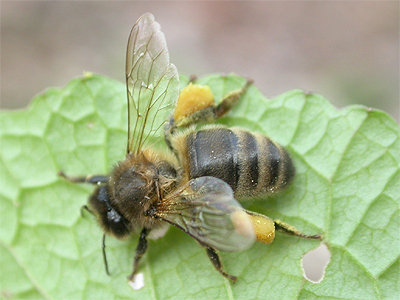 There are three castes within the colony - queen (fertile female) drone (male) and worker (infertile female). After pairing in the late Summer and Autumn, only the young queens survive through the Winter to start new colonies the following Spring. In more recent years, there has developed an increasing trend for new colonies to be started by the queens of some species, the same Autumn after pairing. Both Queens and workers are now sometimes recorded during mild Winter days in the south-west UK, but Winter records in Nottinghamshire, still seem few. It seems that a favourite nectar source at this time of year are the flowers of Mahonia and Winter flowering Heathers. Nests are typically rather small, but colonies can number several hundred workers towards the end of the Summer. Nest sites vary between species, but old mice nests below ground and within grass tussocks are favourite locations. The nest cells are clumped together, rather than the more architecturally constructed nests and cells of Wasps. The familiar Honey Bee should be well known to most people and there should be no confusion in the identification of any Bumblebee with the Honey Bee - yet it does occur. It seems that a complete lack of awareness or understanding among the public, regarding size, shape and colour differences between the two, is to blame. The recent arrival and subsequent spread of Bombus hypnorum (the Tree-nesting Bumblebee) in the UK, has led to a dramatic increase in local Beekeepers being called out to deal with swarms of bees, only to find that the majority of swarms involve Bombus hypnorum nests. 95% of all cases of swarming bees reported by the public, actually relate to Bumblebees, so please check carefully before calling in your local Beekeeping Association. 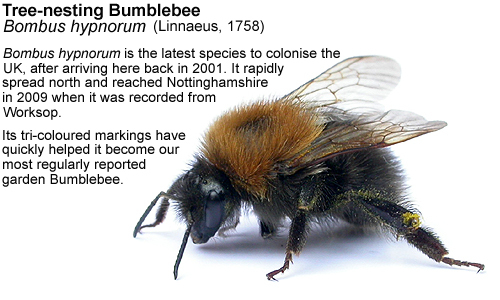 Cuckoo Bees previously had the scientific name Psithyrus, but now come under Bombus. They are so called because of their habit of finding a nest of their host species and infiltrating it. Cuckoo Bees have no worker caste, only males (Drones) in late Summer and Autumn and females (queens) which are most frequently seen in Spring. Only the young Cuckoo Bee queens over-winter and emerge later than their hosts the following Spring, to take over a nest of their host species. The existing queen is usually killed and the Cuckoo Bee queen takes over the colony and produces her own eggs, which the existing workers tend, till new male and female Cuckoo Bees emerge during the Summer months. Identification of some species is extremely difficult by photographs. Several species are supposedly common across much of the UK. Bumblebee identification is quite difficult. The more photographs you take, or the more Bumblebees you look at - the more variation between adults of the same species you see. However, the species' shown on this page are all common throughout the lowlands of the UK and whilst some similar species can only be separated by careful examination, most are relatively straight forward and we have included some of the key identification features for each species. 1. One of the key features of Cuckoo Bees, is the complete absence of pollen baskets. 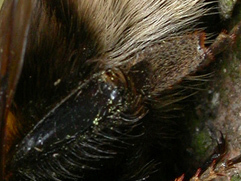 On normal Bumble Bees, the hind tibia is completely bare and shiny (see right hand photograph) whilst the tibia of all Cuckoo Bees are hairy. 2. Single orange or yellow band on thorax and with no other large orange or yellow band on the abdomen, is distinctive of some Cuckoo Bee species. 3. Single thin yellow/orange band or patches on abdomen, as in the Cuckoo Bees B. bohemicus and B. vestalis, compared to B. hortorum on the right. Description: Bombus hortorum is a common Bumblebee, often found in gardens but will turn up at most well vegetated sites with a profusion of nectar-bearing flowers. Distinguishable by the three yellow bands (two on the thorax and one on the abdomen) and with a white tail. The queen is illustrated. 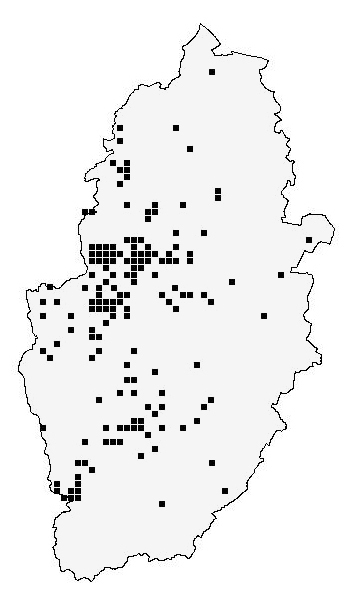 Nottinghamshire distribution: The lack of recording Hymenoptera in Nottinghamshire means we know little of the current distribution. The map certainly indicates a fairly widespread distribution, as it is largely based on single observer records. Description: Bombus lapidarius is a very easy Bumblebee to identify when seen well. The Queen and workers are entirely black, with a large red patch at the tip of the abdomen. Males have two yellow bands on the thorax. 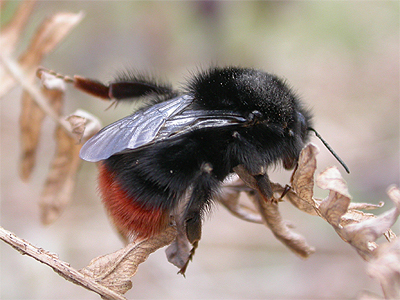 Similar species: Only Bombus rupestris, which is differentiated by having smoky, dark wings. In B. lapidarius the wings are clear. 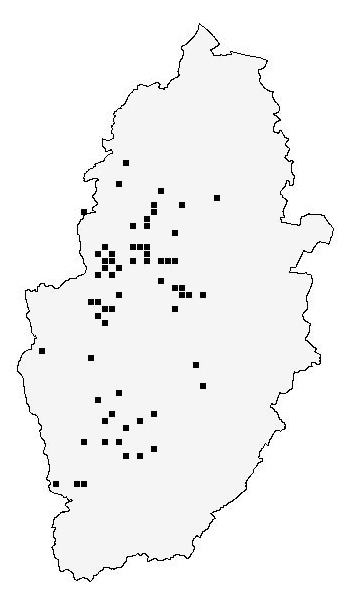 Nottinghamshire distribution: One of our most widely distributed and distinctive species, with a range incorporating the whole of Nottinghamshire. The distribution map is rather misleading, suggesting few records from the Trent Valley. Description: Bombus lucorum sensu lato is a species complex which encompasses Bombus lucorum, Bombus cryptarum and Bombus magnus. None of these can be reliably distinguished from each other. 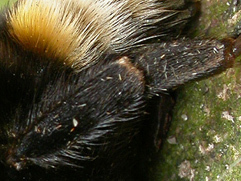 B. lucorum sensu lato is similar to B.terrestris and best distinguished by its more lemon yellow banding, rather than the typically darker yellow banding of B. terrestris . 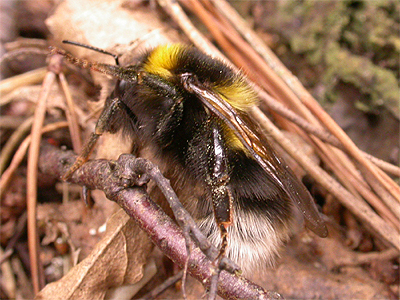 There are two yellow bands (one on the thorax and one on the abdomen) and the end of the abdomen is pure white, not distinctly buff as in B. terrestris. The queen is illustrated. 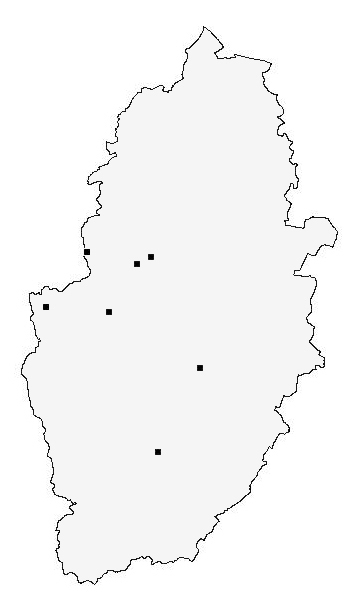 Nottinghamshire distribution: Widespread across Nottinghamshire in a variety of habitats. There seem to be few records from urbanised areas, but it does occur in suburban parks and gardens. Description: Superficially like Bombus hypnorum, but the thorax and end of the abdomen are orange/brown, although this fades with age. Similar species: Unlikely to be confused with any other Bumblebee found in Nottinghamshire, but there are much rarer (and similar) species found elsewhere in the UK. Nottinghamshire distribution: One of our most widespread and common Bumblebees and often the latest Bumblebee to be found visiting flowers in the Autumn. Once again, the distribution map is misleading, as this species is found throughout Nottinghamshire. It is certainly not particularly fussy about habitat, being found in gardens, woodland and arable farmland. Description: Bombus hypnorum (commonly called the Tree Bumblebee) is a distinctive tri-coloured and easily recognised Bumble Bee. Its rate of spread across the UK has been phenomenal and it is probably our easiest species to identify, leading to many records from the public. 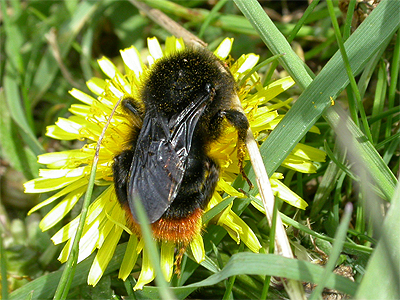 Similar species: Can only be mistaken for Bombus pascuorum. 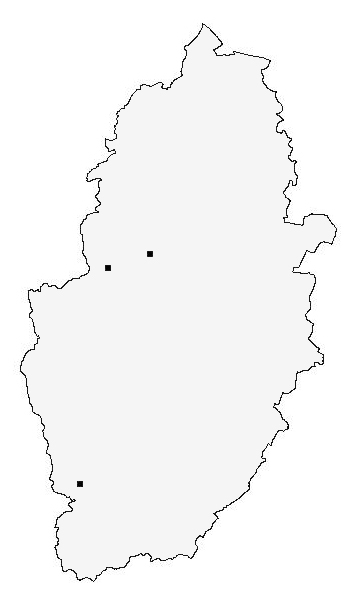 Nottinghamshire distribution: Bombus hypnorum is the latest species to colonise the UK, after arriving here back in 2001. It rapidly spread north and reached Nottinghamshire in 2009, when it was recorded from Worksop. 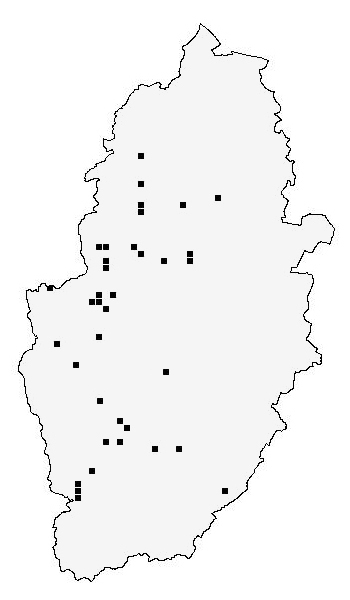 Other Nottinghamshire records quickly followed in the early part of 2010 and by 2012, it was on its way to becoming one of our commonest species. Presently (2018) Bombus hypnorum is the most regularly encountered Bumblebee for many, largely being found in parks and gardens, rather than the more rural locations of some other species. Nests are regularly found in roof spaces and bird boxes. 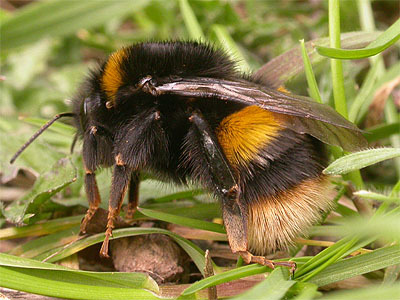 Description: Commonly referred to as the Early Nesting Bumble Bee, this smaller species has one (usually) two yellow bands on the thorax, with another at the base of the abdomen and the end of the abdomen orange. Often nests very early in the year and we have seen workers as early as late February and early March on Sallow flowers. The queen is illustrated. Similar species: None. The combination of small size, yellow bands on the thorax and abdomen and orange at the end of the abdomen, make this a relatively easy Bumblebee to identify. 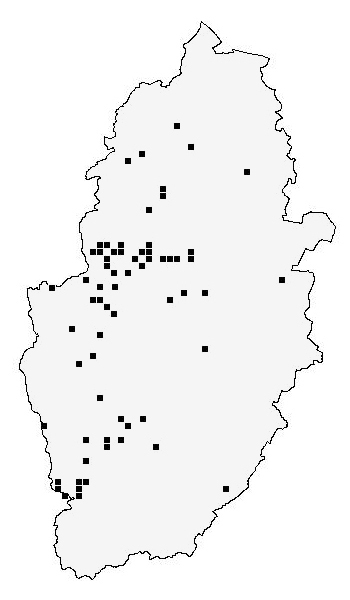 Nottinghamshire distribution: Fairly common and widespread, almost certainly very much an under-recorded Bumblebee in the county. Description: Has single dark yellow bands on the thorax and abdomen, the base of which is usually distinctly buff and not as white as B. lucorum Queens. Both Queens and workers are now often recorded visiting flowers on mild Winter days in the south-west UK, but this has also been recorded from Nottinghamshire recently. 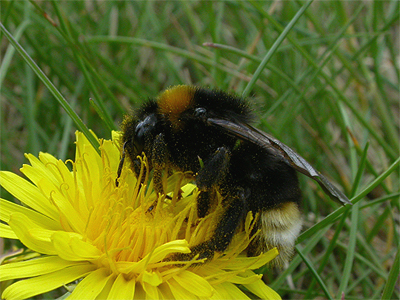 Similar species: Bombus terrestris is only likely to be confused with the similar B. lucorum. 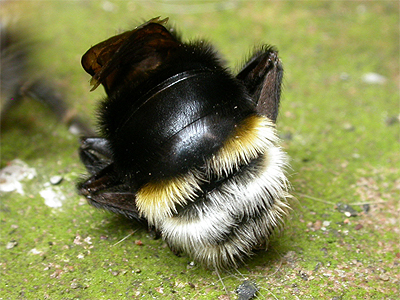 However, in B.terrestris, the end of the abdomen is usually buff coloured and generally appears less white (or as distinct) as that of B. lucorum. 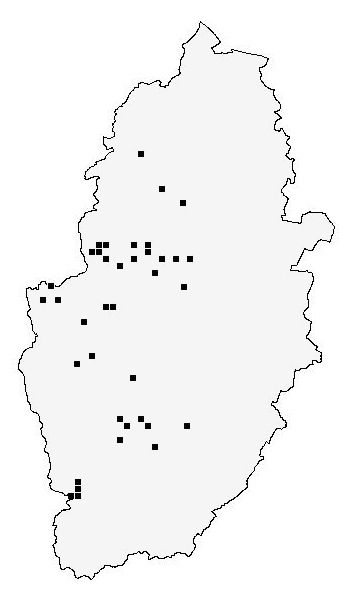 Nottinghamshire distribution: Very common and widespread across all habitats throughout Nottinghamshire. One of our most familiar Bumblebees of parks and gardens and in our own experience, is the most often recorded Bumblebee away from urban areas. Description: Bombus barbutellus is to be an uncommon cleptoparasite of Bombus hortorum. It closely resembles B. hortorum, but has a much more rounded face, while the face of B. hortorum is more elongated. 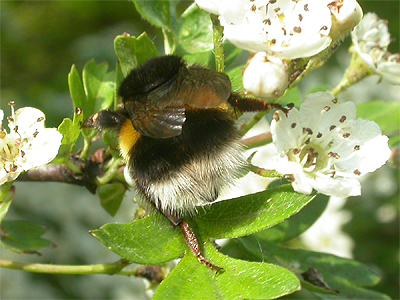 Nottinghamshire distribution: There appear to be very few records for this Bumblebee in VC56 Nottinghamshire and it may actually be uncommon here. The only records we presently know of, date from Sherwood Forest CP in April 2010 and 2011, then more recently in May 2016 (Pendleton, T.A. and Pendleton, D.T.). There are single records from the former sand quarry at Market Warsop in April 2014 (Pendleton, T.A. and Pendleton, D.T.) and also from Attenborough NR in 2015 (Sexton, T.). 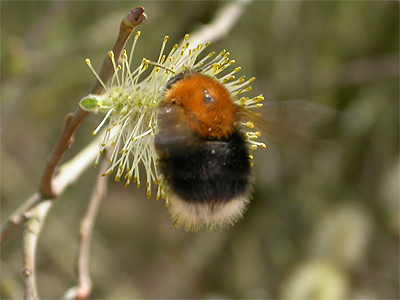 Similar species: Bombus bohemicus is visually almost identical to Bombus vestalis, but the thin yellow band/line of hairs seperating white from black sections on the abdomen, are a slightly darker yellow and more restricted in B. bohemicus than B. vestalis. 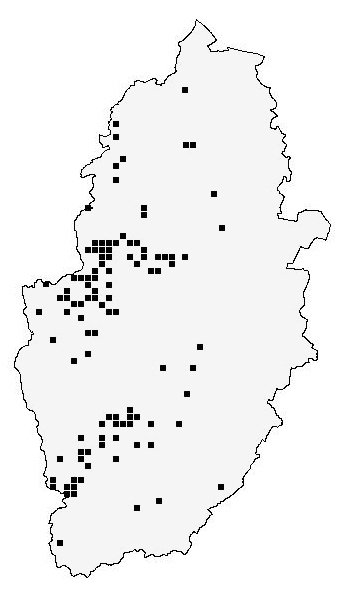 Nottinghamshire distribution: The difficulties of separating this species from Bombus vestalis and the general lack of interest in our Hymenoptera, means we have very little knowledge of its distribution in Nottinghamshire. It is believed to have a more northerly distribution in the UK, but both species are likely to be possible at many Nottinghamshire sites. There are records from Market Warsop in 2016 (Pendleton, T.A. and Pendleton, D.T. ), Attenborough NR in 2015 and Sherwood Forest CP in 1985 (Archer, M.) and in 2010 (Pendleton, T.A. and Pendleton, D.T.). 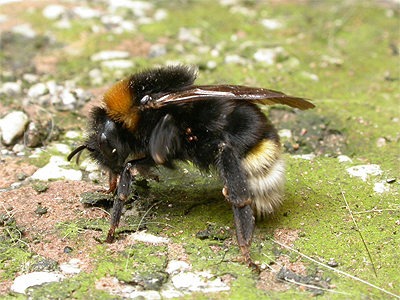 Description: Another cleptoparasite, Bombus rupestris takes over the nests of the Red-tailed Bumblebee (Bombus lapidarius). Completely black, apart from an obvious red band at the end of the abdomen and has very dark wings compared to B. lapidarius. 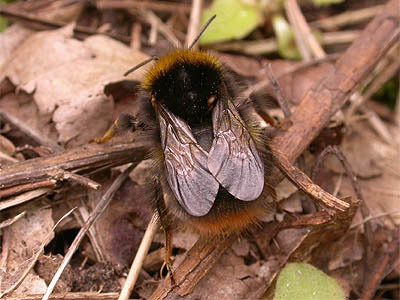 Similar species: Really only confusable with B. lapidarius queen in Spring and Autumn, which has completely clear wings. 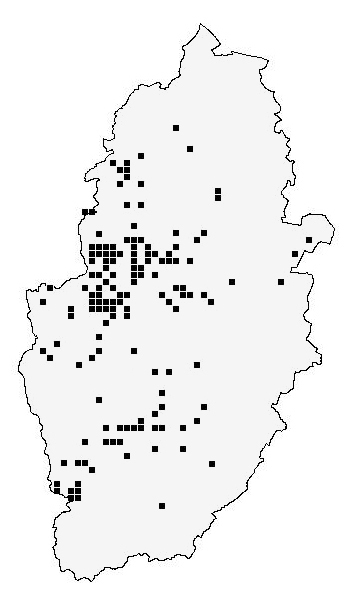 Nottinghamshire distribution: Either genuinely scarce or just another much under-recorded species in Nottinghamshire. The only sites we have recent records for include Oak Tree Heath at Mansfield in 2008, Sherwood Forest CP in 2010, Netherfield Ash Lagoons in 2012 (Netherflield Wildlife Group), Nottingham Trent University's Brackenhurst Campus in 2016 (Andrews, L.), Sherwood Forest CP and nearby Clipstone Old Quarter (Sherwood Forest) in 2016 and at Silverhill Wood in 2016 (Avison, C.). 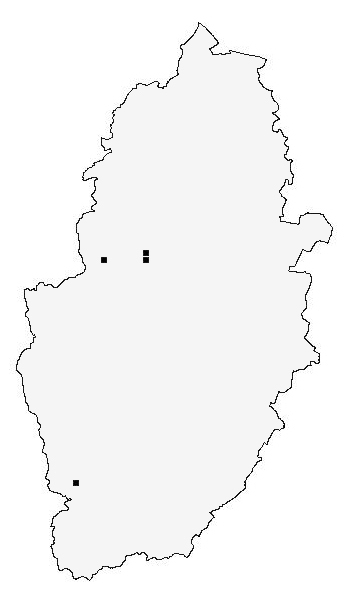 Nottinghamshire distribution: Common in Nottinghamshire and certainly under-recorded and much more widely distributed than the map suggests. 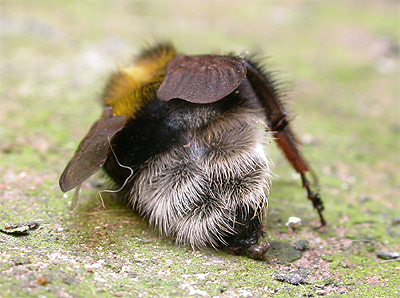 Bombus vestalis shows a more southerly distribution in the UK, usually being replaced further north by B. bohemicus.